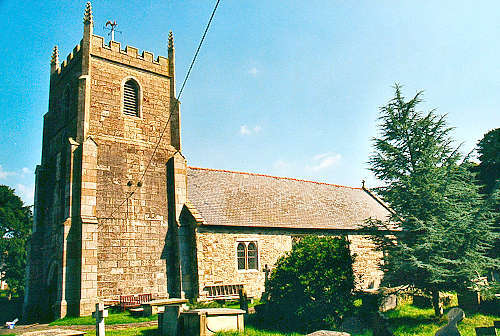 The ancient parish comprised the Denbighshire townships of Bodlith, Llan, Lledrod, Lloran, Llys Dynwallawn (also known as Estyn Allan), Moelfre, Priddbwll, Rhiwlas Isfoel, Rhiwlas Uwchfoel and Sycharth and the Shropshire township of Sychtyn. In 1844, portions of Lledrod were assigned to Rhydycroesau (which is partially in Shropshire). In 1877, parts of Sycharth and Priddbwll were assigned to Llangedwyn. During the late Victorian period, parts of Moelfre and Lloran were assigned to Llangadwaladr. The earliest part of the present building dates from the thirteenth century, although there had been a church on the site from considerably earlier times. Much of the present building dates from the early fifteenth Century. The tower was built in 1832, following the destruction of the wooden spire by fire. There was a major restoration during 1889/1890, and the church was re-opened in June, 1890. For family history information about the church and parish, visit the GenUKI Llansilin page.